The advocacy group representing people with disabilities and mobility issues is demanding TransLink assume responsibility of the transportation service, making their feelings known at a Mayors’ Council meeting this week. 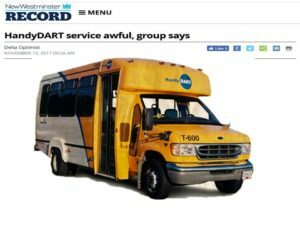 TransLink is considering once again contracting out HandyDART. A report to the Mayors’ Council on Regional Transportation calls for the transportation authority to bring the service in house as a public service rather than contracting it out to a large corporation. The HandyDART Riders’ Alliance says the rights of the disabled are being violated, saying it sees the poor quality of service associated with contracting out as a human rights violation. The advocacy group filed a human rights complaint with the B.C. Human Rights Tribunal. A province-wide survey of riders conducted earlier this year by B.C.’s seniors’ advocate found significant dissatisfaction with the service.